I'm using Provide Web Service to generate the WSDL. My messages are nonrowset based and have properly validated schema in them. The WSDL is generated and I can access the WSDL. I was able to use SOAP UI to import the WSDL and see the message structure. But the schema is included in the WSDL as a .xsd reference. How can I get the schema to embed in the wsdl as I need to send .wsdl file to a 3rd party application for consumption. Can you post the URL that appears in your WSDL that refers to your XSD? Does it reference your own servers, or Oracle? If they are relative locations and not full URLs, they might exist in the same URL location as your WSDL file. Is it possible to embed the schema in the WSDL instead of having import statements? The messages are nonrowset based. The schema was added manually to the messages. 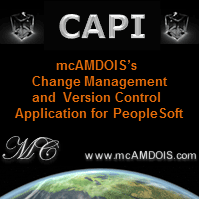 The integration is with a 3rd party non-peoplesoft system. We need to provide the WSDL to the other system. Clearly, the WSDL having import statements won't work. I need to have the schema in there. I generated the SOAP template from the Service definition page, but that too has a reference to the XSD. What is the proper way to do this? Do I need to manually copy-paste the schema in the WSDL? I can't say I've tried to embed XSD into a WSDL, but it may be possible. The PeopleSoft functionality always separates the XSD and WSDL and I think that's fairly standard practice. Can the 3rd party system access the PeopleSoft server and the XSD files if you provide the full URLs to them? I am having the same issue, did you guys found a solution for this? I'm having the same issue as well. I'm trying to provide the delivered web service QAS_EXEQRY_SYNC_REQ_MSG but the import of the schema location QAS_EXEQRY_SYNC_REQ.VERSION_1.xsd doesn't work.